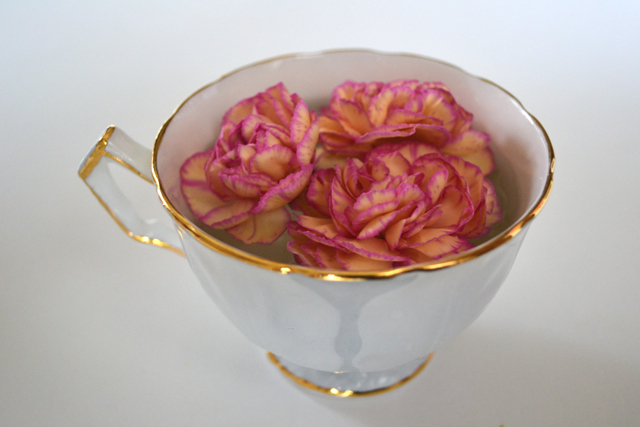 ...the carnation, that is. A fickle flower, yes? So vehemently hated by many. Why is that? I'll be the first to admit it's not what I immediately gravitate towards, though I'm beginning to think this has more to do with a conditioned bias against it. Actually, I find I'm quite fond of the variety when I give myself the chance to be. And this particular bunch? Crikey. Layer after velvety layer of peach, butter cream, honey, blush and pink. With more than fifteen usable stems in a $4 bouquet and a vase life of two weeks, I can't get enough. 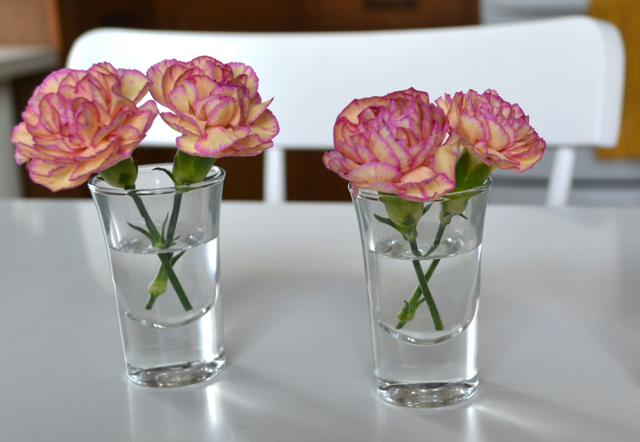 For the observant, those are indeed shot glasses housing my pretty carnations. I love them in huge bunches, all one color...great for parties since they are inexpensive! yes! 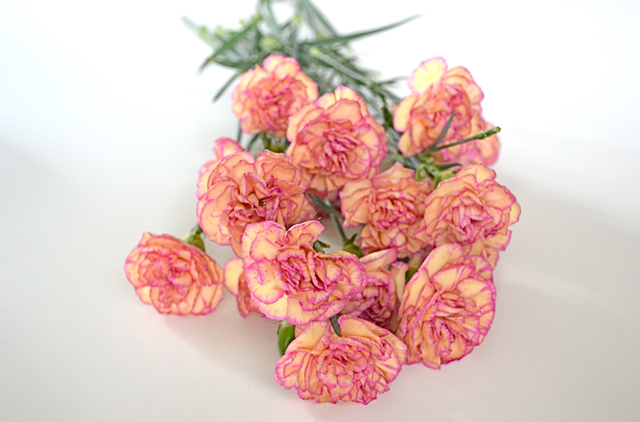 carnations are definitely underrated. I remember seeing photos, once, of a wall covered in carnations... it was so pretty. Definitely underrated, but could be improved upon. Kind of similar to babies breath(which I love btw). You did a good job highlighting them making them look pretty. Pink ones were my Grandma's favourite. I always think of her when I see them. And that makes me smile. 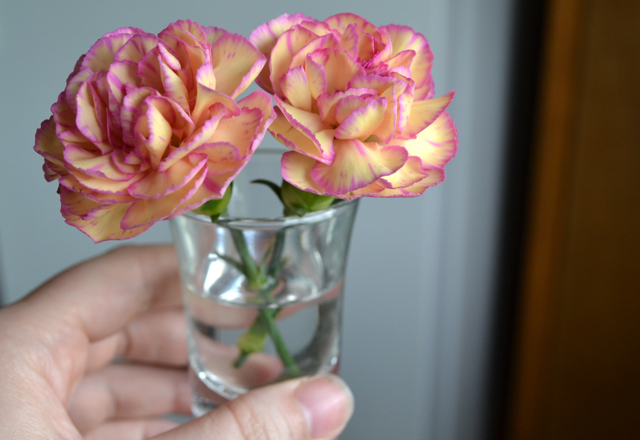 They're such a long-lasting flower. You've got to give them credit for that! carnations were always my mom's favorite. i do love how ruffly they are, and it's sad they get such a bum rap. I think anything that gets coined "cheap" immediately loses its appeal, except maybe food from street carts. 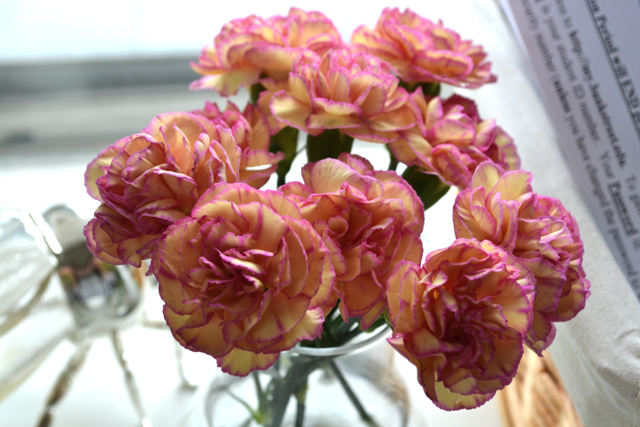 But carnations are so impossibly sweet, and I particularly love huge bunches of them! Like Susan I like them in big bunches best. I would choose them over Gerberas that's for sure! Gorgeous! I definitely think you made your set of carnations feel VERY appreciated! 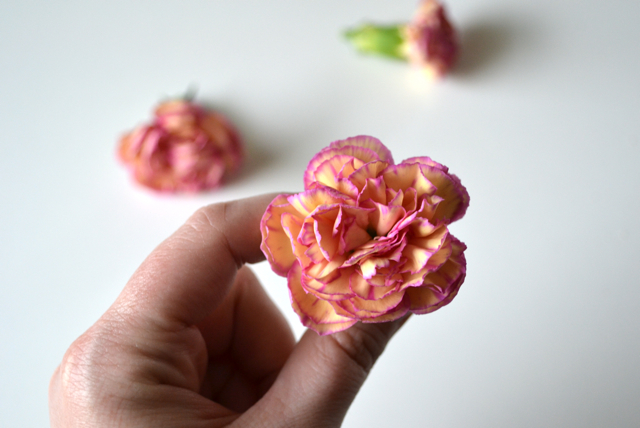 I've been wondering the same thing as I've taken my flower class! Why do we dislike them? Way to embrace the carnations Kayla!